Are you ready for Fall? Now that the kids are in school, maybe you have time to take a breath, and think about getting ready for the cooler seasons. Here in my southern state, we sometimes have warm weather for another month at least and it would be unusual for me to pull out a jacket before October. However, this year I am trying to be intentional about my wardrobe and planning ahead. I’ve pared down my closet so well that I think I finally have a chance to pull off a true capsule wardrobe this time! The more I shop Amazon, the more wardrobe staples I seem to find. Here are some amazing Fall fashion trends you can order with free two day shipping right now! Skinny Jeans To my delight skinny jeans are still in, although the latest trends focus on details like frayed hems or even a side stripe. 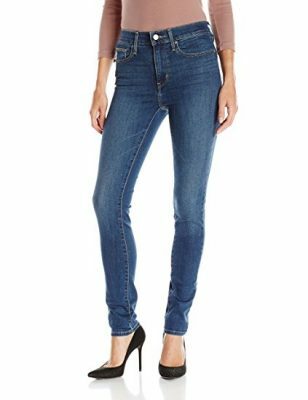 Finding a great skinny jean is possible, no matter what your shape or size! My very favorite brand of all time is still NYDJ, but it can be hard to find a deal; so keep checking Amazon for falling prices! Scout out your local TJ Maxx, Marshall’s, and Nordstrom Rack also. Other options for slimming brands include Gloria Vanderbilt and Levi’s Slimming skinnies! Be patient and keep trying until you find a style that works for you; if you find great jeans, the rest of your wardrobe will come together with ease! Tip: Instead of having multiple pairs of denim jeans, try grabbing a second pair of jeans in a different color like burgundy, olive or mustard! You’ll really maximize your outfit options that way. Knot & Twist Detail Tops- I’m really enjoying this new trend of detailed tees. They add a little something extra to a traditional tee and can also serve to camouflage a problem area (at least in my case). Check out these fun options including cold shoulder versions, long and short sleeves, and fun floral prints for an extra pop of color! 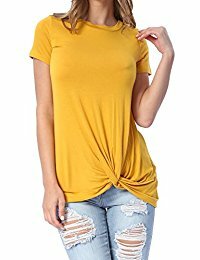 I love that you can wear a nice loose tee yet still have a little structural interest with this style! Color Block Tees-Here’s another fun idea that I think will really elevate my boring tshirt collection. Not only does this trend mix great colors (and even patterns and prints), but the baseball style cut and tri-color styles can also be really flattering and give the illusion of an hour glass figure! 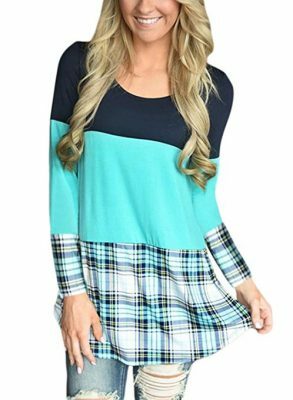 My favorite options are the Color Block Tunic from Hount and these Plaid Hem Tees by Sherosa. I think these would look great with skinny jeans and layered up with cardigans for Fall! Click here for more Color Block Tee options! 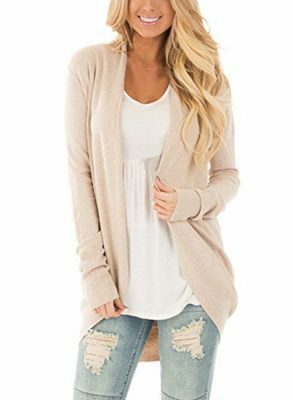 Cardigans-Cardigans are ALWAYS going to be a Fall staple and the great thing about them is you can find so many unique styles. If your climate is not super cool, take that into account and find a very thin fabric, then you’ll be comfortable and set for the season! My favorite silhouettes are: the Circle Cardigan, the Drapey Cardigan and the Chunky Cardigan. If you’re tired of the same-old solids, mix it up with a floral cardigan or a striped version! Remember, Cardigans are great to layer over almost anything, so you can easily carry many of your summer favorites into Fall with a good cardi! Statement Necklace: Jewelry is a fashion category that I tend to overlook, but it really helps to pull your outfit together. The perfect statement necklace can work equally well for casual outfits or dressier ones! I love checking out the lovely styles from BaubleBar or Kendra Scott and then searching out a budget version on Amazon. 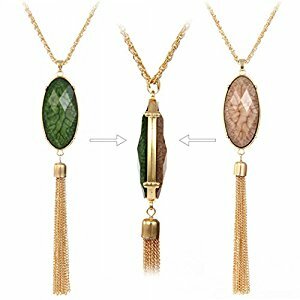 For example, I absolutely LOVE this gold tassel necklace by Huimei; it’s reversible with great Fall colors and reminds me of the Kendra Scott Rayne necklace, which is just gorgeous! Another great option that I think would really stand out is this Glitter Statement Necklace by Lux; both of these are only about $10! Scarves: I love scarves and used to crochet and knit them as a hobby. Now that I have a more simple closet, I’m sticking with fewer options but I hope to pair them with MORE outfits! 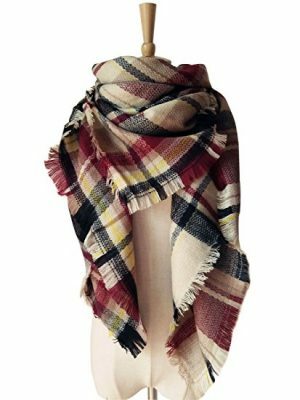 Here are my three favorite scarf picks for Fall: Option 1: Plaid scarf, Option 2: Fringe Infinity Scarf, Option 3: Lightweight Print Infinity Scarf. For this last category, I have to tell ya’ll that Walmart has some amazing infinity scarves this year for only $2.98 each! The patterns are darling, I love the soft, light-weight feel and the price couldn’t be better. I counted at least 10 great Fall colors last night at my local store. Here’s a link for your reference. 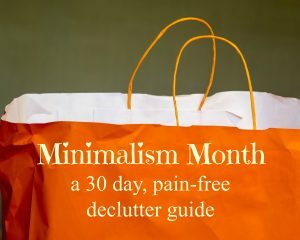 With just a few basics, you can set yourself up with truly flexible capsule wardrobe from Amazon. 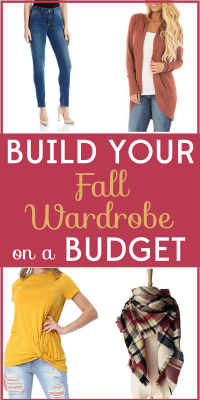 Have you found any great bargains for Fall? Tell me about them in the comments! Tuesday Freebies- Free Milkshake from Hwy 55!